Grrrrrf. Arf, yes, that means that means "hello again." I've mentioned that here before. I'm Pluckie. I'm a dog--a spaniel-terrier mix--and people tell me I'm good luck to them because I'm black and white. That's one of the reasons I'm blogging here today: good luck. You see, I've been told what I'm saying here will appear on the Killer Characters blog, and this is December, which they said is a month of giveaways there. That means that a lucky human winner somewhere in the USA who comments about my blog either today or tomorrow, December 19, will win a copy of the third Superstition Mystery that features me, as they all do. That one is Unlucky Charms. My human, Rory Chasen, says I get to pick the winner from the list of comments we get here. I'll just use my nose to point to one and let Rory know. She's been my human since long before we moved here to Destiny, California, which people say is all about what they call superstitions. I don't know a lot about superstitions, but I do like the idea that I'm said to bring good luck. I hang out a lot with Rory at the store she manages, the Lucky Dog Boutique. That place has all sorts of pet stuff that's supposed to be lucky, and I get to play with a lot of it. I'm also there to help make Rory feel better. She brought me here to check out the reality of superstitions after the nice guy she was engaged to, whatever that means, got hit by a car and died after walking under a ladder. And now, she winds up getting involved with other people who die--who are murdered here-- and she needs to figure out who really did it to help her friends or, in the case of Unlucky Charms, herself. Black and white dogs are especially lucky if you're going to a business meeting. Come and hang out with me. I like having luck. I'm so southern and we have many superstitions in our culture. I do think you are lucky! But that also goes along with the action that I leave out the exact same door I entered, I don't sleep with my feet pointed to the door, I don't tell my dreams before breakfast. . .the list goes on and on. This is Linda--and I won't tell you the various things I do to try to remain lucky, especially since I started researching superstitions! A good one, of course. Thank you--and it doesn't hurt to follow your favorite superstitions! There are different opinions about black cats, but I like to think of them as being lucky. Black and white dogs too, of course! I certainly think I'm lucky. And good luck to you! That's for sure. Getting some good luck is always helpful! All black dogs are also lucky, but black and white ones are particularly lucky if you're going to a business meeting. And in other cultures black cats are always considered lucky. Before reading this series, I had never heard that a black and white dog is lucky. Can't remember ever having one, though. Maybe if I get one, I can win Unlucky Charms! bobwiesmann(at)gmail(dot)com. And the black and white dog you choose would be lucky, too! There are two black and white dogs in my family and I do believe that they bring good luck. They bring us good luck by just being a part of our lives and all the love they give us every day. Happy Holidays! Yes, pets are family and most likely always bring good luck! Happy holidays to you, too. Used to have a Dalmatian. She was a wonderful dog. Dalmations are definitely black and white so they must all be lucky! Black dogs are considered lucky, and so are black and white ones, especially if you see one on your way to a business meeting. I like the idea that black and white dogs are lucky---but I think all dogs bring you good luck because they give you such unconditional love. Thanks for the giveaway. Isn't it funny how different cultures view things that are lucky?? I think my luck comes and goes. One thing I always try to tell myself when something or things aren't going my way is that my bad luck won't stay around forever. Eventually it will turn around and good things will start happening. I'm just starting (and loving!) 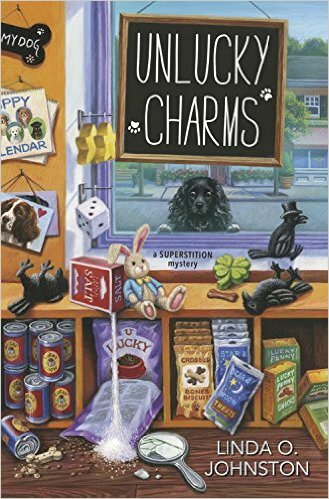 this series so I would love to win a copy of Unlucky Charms. Thanks for the chance! Great attitude. And I'll bet you mostly have good luck! My cat is black & white & I feel that I'm lucky to have her. Thanks for the chance. I have a little black and white dog! I had a black and white horse too!! Love the books! Black and white must work well for you. And thanks! I have a black and white cat, a tuxedo. That should be good luck, right? Donamaekutska7@gmail.com forgot it before black and white is lucky! Interesting variation on the superstition. Maybe the people in Destiny, California, in the Superstition Mysteries should seed their sidewalks with lucky heads up dimes instead of pennies! I'm not superstitious, but I like the idea of black and white dogs being lucky. So do I, and lots of other people, too! And I've always found the supposedly unlucky number 13 to be lucky for me! And again, it depends on where you are whether black cats are supposed to be bad luck. Sounds like all good luck to me! Sounds like you're at least aware of superstitions even if you choose which to follow! And thanks for reading. Wow--you sound like a true expert in superstitions! Yes, there are a lot of superstitions. And thanks! I have a solid black pom/pug mix I rescued from an abusive situation. She is so black, that when I try to take pics of her, you can never see her eyes...lol....she is just a black blob in the pics. But she is the best and smartest dog I believe I have ever had the honor of having as a "roommate"
She sounds wonderful--and how great that you rescued her! I didn't know black and white dogs were lucky. But I think any pet is lucky. Even my cats, who rule the household. I do knock on wood for luck. I'd love to win the third one in the series. I think I have the first two. laughlincat2(at)gmail(dot)com black and white seems like colors for a tuxedo cat and luck is where you find it. Appreciate opportunity. Thank you.